Monster Hunter 3 Ultimate came with the highest expectations imaginable, not only as a series entry and expansion of Monster Hunter Tri, but also as a game in its own right. So the question is: does it live up to that hype? More importantly, how do the 3DS and Wii U versions compare? Despite the simplicity of that question, newcomers and those coming right off Tri will probably have very different answers at first. Ultimate starts off from the same single-player campaign as Tri, using the same missions, the same story, and—ugh—the same tutorials. Newcomers won’t know the difference, of course, but if you already played through Tri it can be a bit frustrating to go through the game all over again. You’ll definitely enjoy yourself on the way, though. 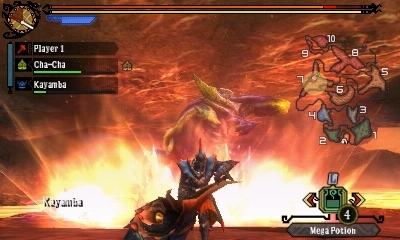 Monster Hunter 3 Ultimate is a solid experience, taking the best of Tri and building on it. Hunters will once again take on quests that can often send them into the field for most of an hour. Along with their Shakalaka pals, who act as partners in fights and can even give the player healing and buffs, players will track and defeat monsters big and small. Depending on the quest, you might also be sent to gather a specific item or capture a bigger monster. Setting off from camp with the equipment and items that you’ve made mostly from scratch in-game (supplemented only by the limited Supply Box at the quest’s start) always brings a feeling of anticipation, and Ultimate delivers each and every time. 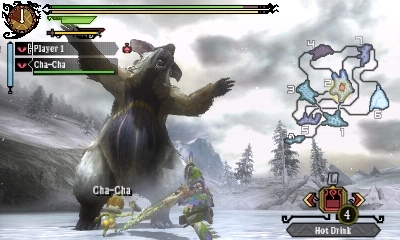 Though the 3DS obviously can’t stand up to a console pixel-to-pixel, everything is absolutely beautiful in 3D, to the point where some of the bigger and faster monsters can actually be overwhelming. The touch screen is fully customizable for the most useful setup, and you can even get the HUD completely off the top screen if you’d like. 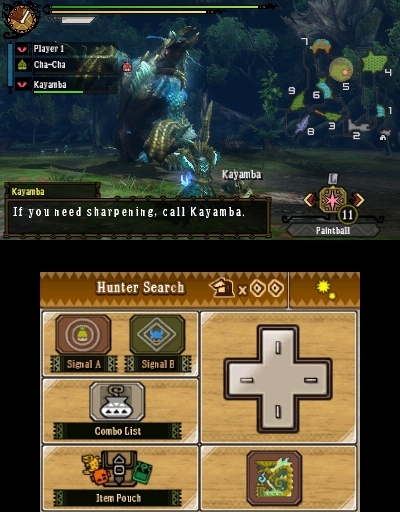 The game’s controls are flawless with the Circle Pad Pro directing the camera, although the game can be surprisingly playable even without it—just don’t expect to keep up with certain flying monsters or underwater. Unfortunately, for many hours early in the game, fans of Tri won’t find much new beyond what the 3DS itself has to offer. Although the Arzuros, Great Wroggi and Lagombi will show up relatively early on, they’re really sparse appearances among a bulk of old-timers. They’re not all that challenging, either, and you won’t take the new monsters seriously until after you’ve fought the Lagiacrus and unlocked the battle against the Duramboros. That massive hulk was one of the first things that really challenged me in Ultimate. Defeating it earns you Kayamba, a second Shakalaka whose rivalry with Cha-Cha will provide even more comic relief while the two join you. Having them both allows the rest of the Tri story to go a little more easily, and it’s spiced up with a few extra bosses, too. But it’s not until they finish the original story that Tri fans—and newcomers, who by that point should be seasoned hunters themselves—will drop their jaws. A whole new tier of missions is unlocked, allowing you to fight your way up from Rank 6 all the way to Rank 9 missions. Yes, on top of what was already going to be dozens of gameplay hours easily, depending on your playthrough speed, Capcom stacks just as many more. The new missions are considerably tougher than the ones you’re used to, and many take place in the much more difficult night time environment (the previous day-night cycle is notably missing from the game, but this is definitely a better use for it.) Others will send you to the Misty Peaks, a new area that balances out the maps of Monster Hunter 3 Ultimate with a more colorful, overgrown atmosphere. Either way, you’ll face the challenge of being dropped on a random screen in the map—sometimes right in front of the boss—and the Supply Box won’t fill for several minutes. Needless to say, this just adds to the importance of being ready to go and knowing what you’re doing before you leave for the hunt. Besides the new monsters—quite a few of which are remixed variants of ones you’ve encountered before—you’ll start to see many that originally appeared only in the online missions of Tri. This is great news, because hey, we don’t get online here on the 3DS! Seeing the infamous Deviljho appear in the middle of a single-player mission does a lot to make it feel lonely, but if you didn’t really want to play online anyway, it’s good to know you’re not missing anything anymore. There is a multiplayer element, for those of you who do have nearby friends. Rather than the City, which had to be accessed through the main menu, Ultimate sports an area called Tanzia, which is just a short boat trip away from Moga Village. You can sail back and forth at any time and even do your farming from Tanzia using the handy courier. That’s just one example how everything is made easier in this new iteration of the game. Still, Tanzia doesn’t feature much of interest besides the actual capability for multiplayer. It allows you to go solo, but why do that? Missions don’t reward you any differently than similar ones in Moga, so unless you actually have local multiplayer to play, you might not touch Tanzia. After all, everything else you might have wanted out of the mode is now right up front in Moga Village. If you’re thinking about getting the 3DS version of the game, consider it carefully, because the lack of online multiplayer is a serious hit against it. You won’t have a shot at playing with your faraway friends unless you get the Wii U version of the game. On the other hand, if you happen to be old-fashioned like me, maybe you still prefer gameplay to be kept all in the same room. 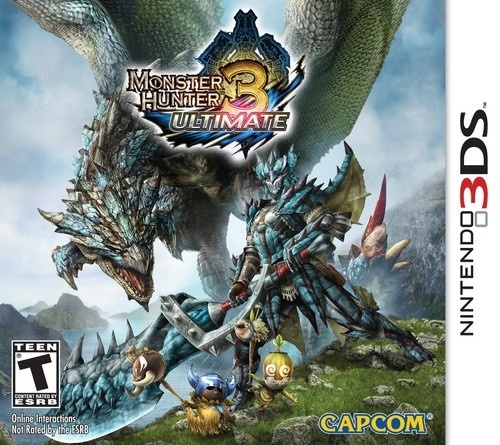 If that’s you, definitely pick up Monster Hunter 3 Ultimate—Capcom has essentially given us a single-player adaptation of everything Monster Hunter Tri had to offer, and much, much more.